The kind of double threat that we consider here occurs when a move threatens two different follow-up moves in such a way that the opponent cannot prevent both of them. These two follow-up moves are said to be miai. A double peep is a classic example of a double threat. Another example is double atari. Double ladder breakers are also another example of a double threat. 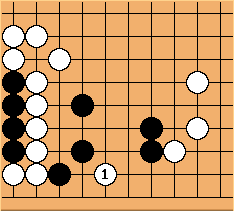 Another kind of double threat is when a play on a particular point of the board is a threat both when this point is played by Black and by White. E.g. a double ko threat. White plays . This move threatens to connect to both the left and the right and is therefore very effective to destroy Black's eye space. 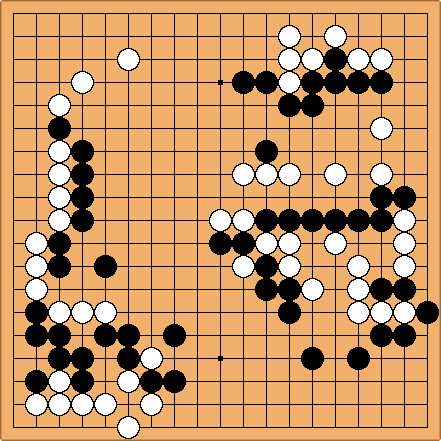 This example comes from this commentary on a game from the 51st Oza tournament between Kato Masao (White) and Lin HaiFeng. Kato did not play , which would allow the double threat of . threatens both a and b, which are miai. Black to play an effective double threat. Examples contributed by: Bill, Chris and Unkx80.